Unpack your bags and forget the world, as your luxury yacht brings Italy’s most special places and unique experiences to your doorstep! On your luxury Catamaran charter in Italy with OMBRE BLU³, you will discover hidden gems of the Italian coastline and islands, still unfamiliar to most visitors to Italy. Our destinations include the Amalfi Coast, the Aeolian Islands (Sicily), Palermo & the Egadi Islands (West Sicily), Sardinia & Corsica and South Sardinia. With over ten years of experience sailing these itineraries, our local knowledge and diversity are unmatched. The yacht is managed by Italian Captain and Chef, Francesco and his wife Australian Captain and Hostess Melissa. To provide the highest level of service, we are assisted by a 3rd crew member. Our Italian itineraries are created for each individual. Our unique hospitality and refined cuisine set OMBRE BLU³ apart. Customized menus are tailored to each group and paired with our personally selected regional wines. To regenerate your body and mind, take advantage of our wellness massage service. You can also experience the unique emotions of diving with your own private PADI instructor. Courses for all levels are available. We are also equipped with lots of water toys, including Stand-up Paddle Boards, Kayaks, Snorkels, Fins, Water Skis, Wakeboard and a powerful Jet Tender. Our delightfully spacious and comfortable 70-foot CatamaranOMBRE BLU³ is built by the cutting-edge shipyard Sunreef Yachts and provides incredible space both above and below decks, including three entertainment areas and bar. The shaded aft cockpit area, all in teak, is 41 square meters and features two huge sun beds, plus a sofa and a large dining table. Teak stairs lead up to the 21 square meter Fly Bridge, which features a very spacious area with cushions for sunning and another large dining table, which is undercover. The foredecks also offer day sunning beds and cushions for you to enjoy whilst sailing or at anchor. We pride ourselves in taking care of your every need, so you can just sit back, relax and enjoy your vacation. Explore the most beautiful areas of Italy and the surrounding seas. Our unique sailing experiences are perfect for families, couples or groups of friends. 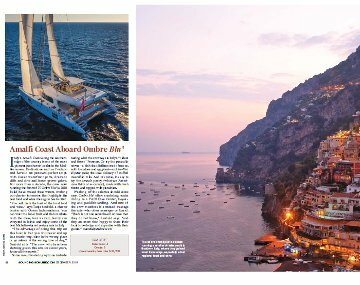 OMBRE BLU³ can be booked via your Travel Agent or a suitable Yacht Charter Broker expert, who can be found on the website of the MYBA Association.